In every language, we need political change. We need a return to values - the values of truth, logic and facts, judgment and ethics. Please go out and vote for Barack Obama and Joe Biden in November. You betcha - this is funny! As a student of religions I want to study and elucidate ritual. The discussion in this article of inculcating habits related to the concepts of the clean and unclean in a social setting speaks loud volumes to me. Dr. Curtis wanted to create a ritual taboo. 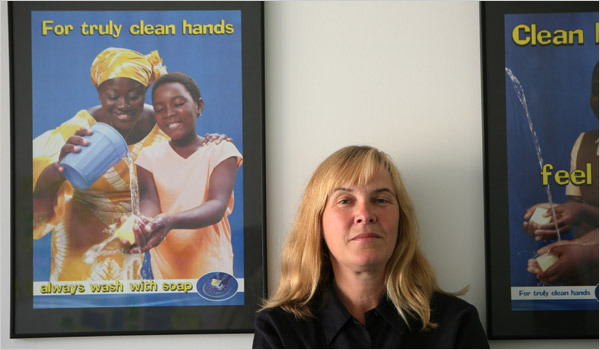 The question I have for Dr. Curtis is why she went to marketers when she could have gone to religious authorities and obtained much better guidance. Have the rabbis done anything more about this since we posted this last, a year ago? So another 440,000 have died. Some effective ban! 440,000 people in the US die each year from cigarettes. ... tobacco use remains the leading preventable cause of disease and death in the United States, causing approximately 440,000 deaths each year and costing approximately $157 billion in annual health-related economic losses. We ought to put a little more effort this year into our anti-smoking efforts in the US, in Israel and around the world. What can you do? If you smoke - stop. And more. Ask all the smokers that you know to stop smoking. Won't you please use your blogs to spread this message and to help save lives? And yes the news now (7/5/2006) is that rabbis say that smoking is a sin. A committee of the centrist Orthodox rabbinical organization said Jewish law is opposed to smoking. The halachah committee of the Rabbinical Council of America said the decision is based on a combination of the value placed by Jewish sources on health and scientific findings on the dangers of tobacco products. The decision calls on all Jews to avoid or quit smoking. This teshuvah is issued unanimously by the Va’ad Halacha of the RCA, whose members are Rabbi Yosef Adler, Rabbi Kenneth Auman, Rabbi Asher Bush (Chairman), Rabbi Daniel Feldman, Rabbi Tzvi Flaum, Rabbi Dovid Gottlieb, Rabbi Chaim Jachter, Rabbi Yaacov Lerner, and Rabbi Zvi Sobolofsky. It is issued with the haskamah of the following members of the Va’ad HaPoskim: Rabbi Dovid Cohen, Rabbi Michael Rosensweig, Rabbi Hershel Schachter, Rabbi Gedalia Schwartz, and Rabbi Mordechai Willig. This story told by one Palestinian lacks all credibility. Specifically, Who, when traveling, leaves $500 in cash in their jacket pocket in their suitcase? The rest of the story this man tells is equally sketchy. I'd ordinarily be inclined to listen sympathetically to a man's story of injustice and frustrating bureaucratic persecution at entry to Israel. Lord knows the Israeli immigration authorities at unpredictable intervals can give anyone and everyone a hard time. What is utterly insulting to all people of good sense is this story's generalization from one bizarre and sketchy anecdote to its conclusion. The title of the story is, "Denied Entry: another step in the ethnic cleansing process of Jerusalem." Ethnic cleansing because one man has a problem? Do not insult our intelligence. But then they do and they will continue to and that is why 60 years later there is no state for the Palestinians. Not because of Israeli policies. Because of zero credibility for the Palestinians. Here below is just one paragraph, in a story about one man, but which makes claims that it speaks of the anecdotes of "thousands" - "who are being ethnically cleansed." Ziad Sad is in the US, a Jerusalem resident, and one of the thousands of Jerusalem residents who are being ethnically cleansed from the capital city of Palestine. Under international law it is illegal what the Israelis are doing in Jerusalem and this is well known by anyone who studies the law or the situation here. United Nations resolutions condemn it; however the Israelis have yet to heed the call. No evidence. No lists. No authority. No logic. Zero credibility. A battle of the subcultures rages in Venice Beach CA. You would think that the adults party to the dispute could work out this friction. After all, this conflict is going to recur every Shabbat, duh! But no. It appears that there is no one in LA who is focused enough to mediate this nonsense. Hey, wait a minute. Maybe we can get Larry David to make this into an episode of "Curb Your Enthusiasm" and convince him to write an ending that resolves the feud. Yeah, that makes about as much sense as this story does. 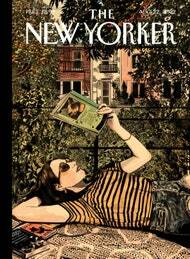 Monica Almeida/The New York Times. The Pacific Jewish Center, an Orthodox synagogue, on the colorful Venice Beach boardwalk. LOS ANGELES — The only synagogue on the Venice Beach boardwalk has weathered 80 years’ worth of oscillating economies, winos, shamans and aggressive panhandlers, disintegration of its own community and surf seekers on all manner of speeding wheels. It has stood as much for tolerance as faith in a community where the former is in high demand. But for its congregants, it has been increasingly difficult to countenance the mannequins in racy underwear, creeping ever so often unto the property of their tiny, sun-bleached house of worship. Over the last few years, the Orthodox synagogue, the Pacific Jewish Center, has been at quiet war with the owners of its next-door neighbor, Unruly, a purveyor of T-shirts, bathing suits and undergarments. Worshipers say workers in the shop blast music on Saturday mornings, overwhelming the religious service held with the door open to the boardwalk. When the worshipers ask for the music to be lowered for an hour, they are met with hostility, they say, some of it smacking of anti-Semitism. Once in a while, the police have been called. Further, there have been occasions when mannequins dressed in G-strings and other clothes that are decidedly not part of the customary wardrobe of Orthodox Jews have been placed on the synagogue’s property line — as a matter of provocation, some members suggest. 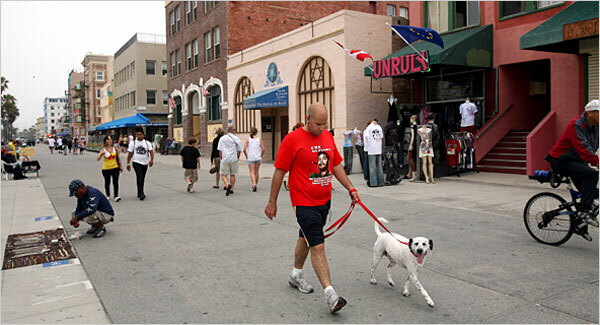 This episodic neighborhood schism might have remained just that, had Eric Mankin, a science writer for University of Southern California publications and a Venice resident, not wandered into Unruly this month, chasing after his dog who had gotten off its leash. Mr. Papadopulos, Mr. Mankin said, replied that he hated Jews — something Mr. Papadopulos flatly denies having said. Mr. Mankin, who is Jewish but not religious, said he was flabbergasted. Sgt. 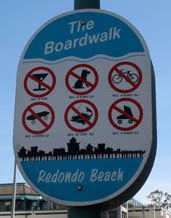 Stephen Showler, who is in charge of the Venice Beach detail for the Los Angeles Police Department, responded. During two generations of life on the colorful boardwalk, where karma analysis takes place next to impromptu pot parties that abut bongo drummers and flip-flop barkers, conflicts among neighbors have been few, say even the synagogue’s oldest members. In the 1920s, as Venice evolved into the “Coney Island of the West,” Jewish immigrants played a vital role on the boardwalk. There were several synagogues along the beach, and the area was dotted with kosher butchers and other Jewish merchants. Working-class Jews from Los Angeles called Venice their summer home, and many others migrated to the area, according to the book “California Jews,” by Ava F. Kahn and Marc Dollinger. The mid-1960s saw an exodus of Jewish families, and the synagogues all but disappeared. The Pacific Jewish Center was headed for a similar fate, but in the mid-1970s, a group of young Orthodox Jews led by the author Michael Medved revived it. About 80 people pile onto the simple benches each Saturday morning to pray against the backdrop of waves. “We invite anyone who has expressed a genuine interest and has shirt and shoes,” said Gary Dalin, a member since 1979. Its most high-profile conflict has been with the state’s Coastal Commission, which has taken a dim view (along with many residents) of members’ desire to hang a strand of fishing line several miles long to create an eruv, or symbolic religious enclosure that would permit them to perform certain tasks, like carrying things, outside their homes on the Sabbath. Mr. Dalin and others said that they had heard Mr. Papadopulos refer to the members as “greedy” and make other vague remarks that suggest he may not be fond of Jews but said that they were not particularly worried or interested. They just want the music turned down. Islam Bullish In A Bear Market The Amana funds, invested according to Sharia, have more than doubled since 2003, to $1.3 billion. The funny thing about faith-based mutual funds is, well, that there's anything called a faith-based mutual fund. For one thing, Scripture is full of exhortations against accumulating wealth. The New Testament, especially, repeatedly reminds followers of Christ that earthly wealth means nothing in heaven. "It is easier for a camel to go through the eye of a needle than a rich man to enter the Kingdom of God," says Jesus. Also, it seems quixotic to apply a religious framework to something as material as the markets. What, after all, does God have to do with mammon? Nevertheless, faith-based funds have grown to nearly $17 billion from $500 million over the past decade, according to Morningstar, which tracks market data. Even funnier is that some religions outperform others on the free market—at least in the short term. Faith-based funds work by screening out stocks that don't reflect the values of the faith group. So the MMA Praxis funds, founded by the Mennonites, have a pacifist and pro-environment bent: their funds screen out most oil companies and weapons makers. But financial companies are "more or less benign," explains Chad Horning, senior equity investment manager at MMA. That's why, over the past year—with oil prices up and financial services down—the MMA Core Stock Fund has performed below the market. The Timothy Plan, a conservative-Christian group of funds, also screens out "sin stocks"—tobacco, alcohol and many entertainment companies—but it doesn't share MMA's "green" perspective. Heavily invested in energy stocks, Timothy's Large/ Mid-Cap Value Fund has outperformed the market over the past year. The big winners in faith funds (if you can be so crass) are the Islamic funds. They screen out "sin stocks"—and producers of pork products. The profitable difference is riba, or interest. 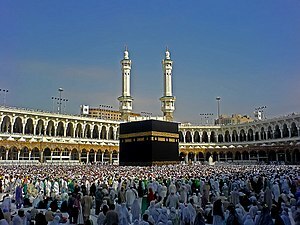 The Qur'an strictly prohibits the borrowing or lending of money at interest: "Whatever you give as riba so that it might bring increase through the wealth of other people will bring you no increase with Allah," it says. Because of this prohibition, Islamic mutual funds, like those in the Amana group, don't invest in financial-services companies: they escaped the subprime mortgage debacle altogether. Most energy companies, however, are fine. "We don't consider ourselves an environmental or socially responsible fund," says Monem Salam, Amana's director of Islamic investing. "Energy was a big part of our growth." Over the past year, the Amana funds outperformed the market; their assets have more than doubled from $400 million in 2003 to $1.3 billion this year. Five years ago, most of Amana's investors were American Muslims, Salam adds. Now, he guesses, 80 percent of new investors are non-Muslims. The managers of the Christian funds say they're in the faith-based business not to help people get rich, but to help them save—for retirement, for college—with tools they can believe in. Arthur Ally founded the Timothy Plan 15 years ago. "There's nothing wrong with having money and making money," says Ally. "What's wrong is hoarding money." At MMA, counselors help investors think about the concept of "enough." "Is it to generate as much as you can in your retirement account? Or is it to generate enough to do what you want to do?" says Mark Regier, MMA's stewardship manager. Amana encourages investors to think about how to give 2.5 percent of their wealth to charity, a tax called zakat mandated by the Qur'an. "You can amass as much as you want," says Salam. "You're purifying your wealth by paying that tax." Faith-fund clients may be happy to know that so-called vice funds, which invest exclusively in tobacco, liquor, gaming and defense, are having a tough year. 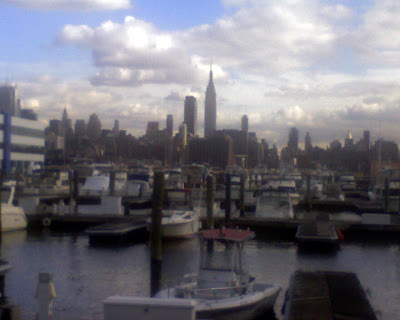 Outside of the UBS Headquarters I took this last year when I first got my Sprint Centro Phone -- looking out from Weehawken across the Yacht Club and the Hudson River towards the City. I post processed the contrast a bit and generally I like the composition and colors. Since my wife is in Argentina and my brother is in Jerusalem, I got to visit my dad in Atlantic Beach for Shabbat. Rabbi Steven Riskin spoke at the ABJC and I only got to hear the end of his derasha. He used the word "tragic" about four or five times to describe the contemporary situation in Israel. I cornered him at the kiddush and spoke to him about my take on his bringing a distorted and negative message to the good diaspora materialistic Jews of the ABJC. Look, I said. The optimist say the glass is half-full and the pessimist says the glass is half-empty. And yet here, even when the glass is 95% full, the Orthodox rabbi says that the situation in Israel is "tragic." What gives? I told him, in fact the situation in Israel today is unbelievably not tragic! I told him, "I respect you and I like you and I think that YOU ARE WRONG." His response was that he must report what he sees and what he believes. I told him no, that he most certainly does not have to do that. And then I went back to eat lunch with my dad. They have a full lunch at the ABJC every Shabbat. Now, okay, this is just lunch. There are no waiters serving martinis at the kiddush here. For those, I am told that you have to go shul in Westhampton Beach. Poor Riskin. He has become an Orthodox Jewish apocalyptic fanatic. One fanatic. No martinis. The food was good, and such large portions! A really touching article in the Times Travel Section about Tel Aviv -- especially since I love surfing and my son got married there! Rina Castelnuovo for The New York Times A surfer and a wedding party present contrasting images in Neve Tzedek, a quiet corner of the city. THERE’S room for everyone in Tel Aviv. I’m riding bikes along the beach with my friend James. James is 12, and moved to Tel Aviv from New York with his Israeli mother two years ago. Originally, even before the Holiday Inn and Howard Johnson arrived, the old hotel at Chelsea Avenue and the Boardwalk was Teplitzky's, a kosher resort that catered mostly to Jewish guests. 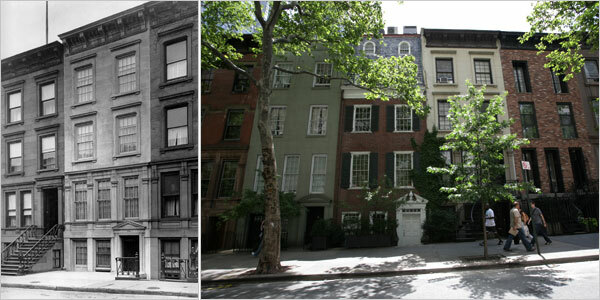 In a tribute to the former owners, the Chelsea will have a Teplitzky's restaurant operated by celebrity restaurateur Stephen Starr. Found during the renovation work for the Chelsea was a Jewish prayer book that came from Teplitzky's hotel. Bashaw presented the prayer book as a gift to Claire Teplitzky, whose mother- and father-in-law, Esther and Hyman Teplitzky, founded the old hotel. House at 1320 hastings Street in Teaneck explodes. Click here for a PHOTO GALLERY from the scene. Police have identified a body recovered from a Teaneck house flattened by a massive explosion this evening as 66-year-old Richard Haas. Hastings Street neighbors reported hearing and feeling the explosion from blocks away. "It was deafening," said Millie Leben, who lives around the corner. "It sounded like a bomb." "My whole house lifted up," said neighbor Meryl Arbisfeld. "I thought there was a bomb in my house. There was a bang, and I started screaming and ran out of the house." The force of the blast blew the house’s front door across the street onto a neighbor’s property. Doug Lehman, who lives nearly a mile away, said his doors and windows shook. Two men were taken to Holy Name Hospital: Milton Bodin, who lives with his wife, Doris, a few doors away, and his son, Michael, who is visiting from Arizona. Doris Bodin said the two were out for a walk along Hastings just before 6:20 p.m. when the blast occurred. She said she got a phone call moments later from the two men, who said they were hurt by flying glass and debris. Residents of the quiet block have been complaining about a gas smell off and on for a couple of weeks, said next-door neighbor Banji Ganchrow. It seemed to be coming from the house that exploded, she said. A PSE&G work crew was out checking homes on Hastings Street earlier this afternoon and told her everything seemed fine, Ganchrow said. PSE&G spokesman Ed Sullivan said the cause of the explosion wasn't clear. He also said he didn't know whether a work crew had visited earlier in the day and hadn't heard of any complaints about gas odors in the area. Abie Cohen, a Hastings Street neighbor, said he smelled gas coming from the corner where the house was when he walked to prayer services on Saturday. Cohen’s lawn is covered in ash. Nestled in his bushes is a burnt piece of paper from a copy of the Torah bearing a Yom Kippur prayer – apparently blown from the blast. Running outside after hearing the blast, Cohen said he saw a dazed neighbor, blood trickling down his ear and leg. Mayor Kevie Feit, who lives a couple of blocks away, said he ran to the house to find nothing but flaming rubble. The only part of the Tudor-style house left standing is part of a brick wall. Three other houses caught fire, but the flames were quickly extinguished. Police have moved people from the area as a precaution. Hass had moved into the home to care for his parents, who died a couple of years ago, said Ganchrow. "He doesn’t have any kids, he doesn’t have anybody," she said, although she said he owns several cats. He also has a vegetable garden, gives out vegetables to people on the street, and often takes bicycle rides, neighbors said. Police had tried calling Haas's cellphone several times after the explosion. Attempts to reach relatives also failed. House on the far left exploded. Neighbors said they'd been complaining of a gas smell. We need the Times... to debunk Jewish the urban legend of no burial in a Jewish cemetery if you have a tattoo. And if it is prohibited to get a tattoo but there is no such punishment...then what is the impact on non-observant Jews? 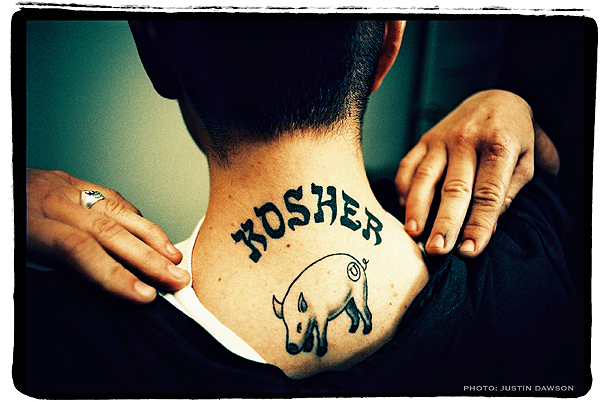 A WAY TO CONNECT Ari Bacharach uses a tattoo as an ironic statement about his Jewish identity. Sorry, I don't have the Top Ten Barack Jokes here. In fact Idon't want to hear them. Now why is that, you ask? It's because I am suffering from eight years of Bush-the-Buffoon fatigue. I am jaded, worn down, fed up, disenchanted, disillusioned, drained, utterly exhausted of having a Commander-in-Chief who is a joke. That's why I am hoping to be refreshed, invigorated, revived, re-energized and revitalized by a new, serious and substantial leader. So when Maureen Dowd asks "May We Mock, Barack?" in response to the mocking New Yorker cover; when others protest that Barack should not be immune from irony; when hilarious comedians spend thoughtful moments worrying about how, where and when to satirize Obama; all of this kerfuffling is not meant to put up an off-limits sign or to imprudently react to teasing our candidate. We all just want to think that it would be proper, fitting, appropriate, suitable and apt to spend some serious time considering the future of our country and to put aside the joking and indeed to get beyond the eight-year-joke who has devalued the decency of the highest office in our land. That's why I don't want to hear the Top Ten Barack jokes right now. 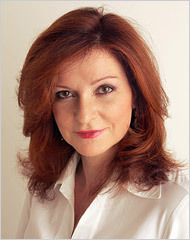 Maureen Dowd says some intelligent things on this topic; not what I am saying here, but worth a peek anyway. Here is a nicely balanced, not overstated, but completely devastating review by Ariel Zellman of a highly tendentious book by an opinionated and bigoted, if not utterly anti-Semitic, professor. It is still early. Given time Obama will pull ahead by a double digit margin. WASHINGTON (Reuters) - Democrat Barack Obama has a 7-point lead on Republican John McCain in the U.S. presidential race, and holds a small edge on the crucial question of who would best manage the economy, according to a Reuters/Zogby poll released on Wednesday. Give a man a fish, and you feed him for a day; but teach a man to fish, and you feed him for a lifetime. It's a nice thought, like a catchy pop song, and by the stunning proliferation of "How-To" guides, it's a very, very overplayed one. Google the phrase "how to" and you'll be inundated with nearly 1 billion matches. For as long as people have been teaching other people how to do things, there have been "How-To" guides. Since the time of the cavemen ("How Kill Mammoth," "How Make Fire"), these celebrations of self-sufficiency have run the gamut of topics, from carpentry and social etiquette, to stock picking and six-pack abs. Indeed, "do-it-yourself" is in our culture's very DNA. In the 1930s, How to Win Friends and Influence People became the manual for success in the business world. Two decades later, Marilyn Monroe starred in the film How to Marry a Millionaire; in the '60s, "How to Succeed in Business Without Really Trying" was the buzz of Broadway. The trend isn't slowing. Visit a Barnes & Noble and you'll see a whole rack of standardized, laminated, fold-out "How-To" guides, courtesy of Quamut (owned by B&N), on everything from baseball to bond trading. Quamut's tag line: "The fastest, most convenient way to learn how to do almost anything." Wisdom's price: $6 per guide. In Quamut land, every subject is given equal weight. Whether your life savings is riding on it or not, the guides are all the same length. (Then again, perhaps "disaster preparedness" and "getting a cat" are essentially the same--either way, it's good to have canned food around, and there may be damage to your furniture.) The guides are written in an anonymous, omniscient voice, giving them the sheen of authority. But who are these experts really? And can they be trusted? Many of the guides don't bear an author's name; others tuck it in fine print on the back. The ninth most popular how-to query on Google in 2007 was "how to levitate." The method here depends on whether you actually want to learn to levitate, or just want to learn to appear to levitate, in order to score with women hotter than you deserve, a la David Blaine. Basic physics dictates that the first method is impossible without the use of heavy pharmaceutical aids, which is not encouraged. To do it the David Blaine way, all you need is a bit of training in how to distract people while creating an illusion. It’s a bit more sophisticated than saying, “Hey! Look over there!," but not that much more. At No. 8 was "how to flirt." First, lower your standards. If you're not actually attracted to the person you’re flirting with, then you can’t fail. Next, be charming. Talk about your Porsche, beachfront bungalow and diversified portfolio of investments that remains remarkably unscathed by the current credit crisis. Make mention, too, of other recent amorous conquests--it will get your target's competitive juices flowing. Finally, get all of this done before your beer buzz wears off. Number one on the list was "how to kiss." Not surprising--the world's full of bad kissers. But there is only so much you can teach. Christopher Varmus is a freelance writer and part-time “manny” who lives in Gowanus Heights, Brooklyn. He realized while writing this article that not knowing how to do anything does not--and maybe even shouldn't--preclude anyone from writing a how-to guide. WINEHOUSE’S KOSHER SPREE: Amy Winehouse must have had a hankering for some Jewish soul food. The troubled songstress recently swung by a number of kosher food shops in London’s Golders Green and seemed to be in good spirits, obligingly posing for pics with fans. Britain’s Jewish Chronicle has a photo, but I found a better one. (I imagine she was having the following epiphany: “All this time, I could have been high on rugelach…”) . TTB says: "By the way, does anyone know who is this person?" ST: Jesse the Fuzzball Ventura for the Senate in Minnesota? Ventura is the epitome of fuzzballness - and many people (especially in Minnesota, take my word on this) are fuzzballs at heart, true closet weirdos. 7/15 UPDATE: HE'S NOT RUNNING UNLESS G-D TELLS HIM TO! Former Gov. Jesse Ventura met with advisers on Friday to map out what a quick leap into Minnesota's U.S. Senate race might look like, although advisers say he still has not made a final decision. That will be revealed on national television Monday night...on Friday afternoon reporters received word that he would give his decision on "Larry King Live" on Monday night. Roly-poly 75-year-old Talansky -- threatening businessman and bully -- what a story! Blowing up Penzer's car. No no oy vey! Not what they ought to do in the holy 5 towns. Morris Talansky is the ordained rabbi, former Great Neck macher, and sometimes successful businessman who may bring down the government of Israeli prime minister Ehud Olmert. In May, Talansky told Israeli prosecutors that he delivered envelopes of cash to Olmert, which he claimed were for both campaign and personal expenses. Olmert insisted on cash, Talansky said. “I just didn't really understand the system in Israel,” said Talansky, and so he acquiesced. But in cross-examination scheduled for this week in Israel, Olmert’s lawyers are expected to paint the roly-poly 75-year-old Talansky as an aggressive, threatening businessman who has long had a reputation as a bully. Talansky has characterized himself as a naïve lover of Israel taken advantage of by a cunning politician. A transcript of secret tapes obtained by New York Magazine suggests that Talansky can indeed be willful and determined, and even threatening. Twenty years ago Talansky invested in a Pittsburgh office building which quickly went bust. He felt he’d been fleeced by the sellers, among them a couple of Long Island rabbis. In the 29-page handwritten transcript, Talansky demanded his money back at meetings and in phone calls, which were secretly recorded. If he didn’t get it, he said, there’d be consequences. At one point an angered Talansky suggested that a bomb would be placed in the car of Richard Penzer, the lead seller on the building. One rabbi confronted Talansky over this. “There were threats mentioned about blowing up his” — Penzer’s — “car,” he told Talansky. At first Talansky denied that any threats had been made, then he acknowledged the bomb threat. Talansky, who one participant at the meetings described as a “wild man,” also introduced a mysterious character named Bernie into discussions. Bernie, he said, had lost a lot of money in the deal. No one ever met Bernie. But Talansky, Bernie’s confidant, let the rabbis know that Bernie was not someone to be trifled with. The transcripts make clear that the rabbis were afraid. For good reason: Bernie apparently wanted to kill one of the participants before Christmas. Is he “some type of Mafia guy?” one rabbi asked. The rabbis grew more frightened when, on Sunday morning, January 19, 1992, three bulky “goons” showed up at the Lawrence, New York, home of Richard Penzer. One of them, Michael Sciotto, later said that he’d gone to collect a debt for Morris Talansky, according to Sciotto’s affidavit. Sciotto later changed his story. After viewing a photo of Talansky, he said the person who sent him to Penzer’s door wasn’t Talansky, but someone who said he was Morris Talansky. Yikes -- what is happening to our religious leaders? Are they going soft on women singing? How are we to know what women are intending. Sheesh. Yes on the one hand. Elihu Richter (Jacob Neusner's brother-in-law) is correct that AHMADINEJAD OF IRAN is indeed worse than Hitler. Richter said in an email today, "The explicit nature of the threats surpasses the anti-Semitic rhetoric of the regime of Nazi Germany, which always used euphemisms. " SPME reaffirms its call for an indictment of the President of Iran, Mahmoud Ahmadinejad, for his repeated statements urging the destruction of Israel. Such statements are direct and public incitement to genocide, which are prohibited by the Genocide Convention and is defined by the International Criminal Code as a crime against humanity. The evidence for the case for indictment includes his repeated and openly inflammatory use of hate language and pseudo-medical metaphors (“Israel is vermin, ….a filthy corpse,… a cancer”) and incitement to genocide (“wipe Israel off the map”), his public denial of the Holocaust (a “myth” created by Europeans to justify the creation of a Jewish state in the heart of the Islamic world”), and support for Hezbollah and Hamas, terror organizations committed to Israel’s destruction. These actions threaten international peace and security, in violation of Article 99 of the UN Charter. Hate language and incitement to genocide by a national leader and his accomplices are recognized warning signs of impending genocide. These actions prompted the indictments, prosecution and conviction of Rwandan journalists, radio broadcasters and politicians by the ICT-R and the Supreme Court of Canada. In Iran’s case, this incitement is alarming because it is coupled with terrorist attacks by proxy, a clear and present danger that genocidal acts will be committed-not with machetes, as was the case in Rwanda, but with nuclear-tipped missiles and other WMD. Iran continues to deceive and defy the International Atomic Energy Agency and has ignored four Security Council Resolutions warning it to stop nuclear enrichment. Its government continues to ruthlessly persecute minority religious groups, women, dissidents, and homosexuals, using public executions, stoning, flogging, torture, arbitrary arrests and imprisonment, themselves early warning signs of genocide. 2. Initiate an inter-state complaint(s) against Iran before the International Court of Justice for direct and public incitement to genocide in violation of the GC, to which Iran is a part. 3. Prepare criminal indictments of Ahmadinejad and his accomplices to be acted upon when they travel outside Iran, based on international principle and precedent and the preparation of international arrest warrants. 4. Quarantine Ahmadinejad and other designated Iranian leaders. Place them on a watch list to prevent their entrance as ‘inadmissible persons”, (as the US did with Kurt Waldheim). SPME condemns permitting his access to podiums to propagate genocidal hate language and incitement. Hate language and incitement to genocide are not protected speech. 5. Apply economic, diplomatic, political sanctions and deadlines and coercive measures via the UN, EU and NATO to ensure enduring compliance with IAEA requirements for inspections, surveillance, and disclosure of all Iranian nuclear facilities and missile delivery systems. So long as Iran’s leadership pursues its genocidal agenda and ruthlessly suppresses human rights inside its own borders, there is no basis for further delay. This statement was prepared by Professor Elihu D Richter MD MPH of Hebrew University-Hadassah School of Public Health and Community Medicine Genocide Prevention Program, and Genocide Prevention Now, based on material and notes from Professor Irwin Cotler and colleagues from the International Association of Genocide Scholars and the Jerusalem Center for Public Affairs. He thanks ... Professors Emily Tall, Ed Beck, and Peter Haas for helpful comments and editing notes and Richard Hellman and and Dr Dore Gold and Professors Israel Charny and Greg Stanton for work related to the ideas in this resolution. Please vote to express your opinion of it in our TTB poll on the right. An apostate is one who converts to another religion. It is not a complimentary term. Yes, I do know that being a Democrat or a Republican is not a religious affiliation. But when you are the number two nominee of one party and then you leave and follow around the number one nominee of the rival party, well I am on firm ground using the metaphor of apostate here. It is safe to say that nobody in the spurned religion likes an apostate. Joe made his bed. Now he has to sleep in it. WASHINGTON — Joseph I. Lieberman, lapsed Democrat of Connecticut, strolled into the weekly lunch of the Senate Democrats last Tuesday, unaccompanied by a food taster. He greeted his colleagues, including some who felt he should not have been there. He ate his lunch (salad, eschewing the mac and cheese) and sat through a discussion about gasoline prices and Medicare. Then the conversation veered into the danger zone, the presidential election — specifically, Senator John McCain’s recent votes, or nonvotes, on energy policy. At which point Mr. Lieberman walked out. “I just didn’t feel it was appropriate for me to be there,” Mr. Lieberman explained the next day. “It was the right thing to do,” said Senator Richard J. Durbin of Illinois, the Democratic whip, who said that a colleague approached him afterward to complain about Mr. Lieberman’s showing up. “This is a delicate situation,” Mr. Durbin summed up. It has grown increasingly so for Mr. Lieberman, once his party’s vice-presidential candidate and now a self-styled “independent Democrat.” He has zigzagged the country on behalf of Mr. McCain, the presumptive Republican presidential nominee, and, in recent weeks, amplified his criticism of Senator Barack Obama to a point that has infuriated many of his Democratic colleagues. At least two have asked Mr. Lieberman to tone down his rhetoric against Mr. Obama, the presumptive Democratic nominee, two colleagues said, and at least three have advised Mr. Lieberman against speaking at the Republican convention, a prospect he has said he would entertain. Clearly, Mr. Lieberman’s already precarious marriage with the Democrats has reached a new level of discord and could be approaching divorce, if not necessarily a remarriage into the Republican Party. The strain has been rooted largely in Mr. Lieberman’s steadfast support for the Bush administration’s engagement in Iraq and his hawkish views on Iran. He has not ruled out switching parties but has stopped short of saying he has moved so far from the Democratic Party — or, in his view, the other way around — that he is at a point of no return. As Mr. Lieberman spoke, a group of protesters not far from his office were calling for his party to oust him as chairman of the Homeland Security and Governmental Affairs Committee. The organization, unsubtly named LiebermanMustGo, was delivering a petition proclaiming the same. Will the protest or petition have any effect on him? “No,” he said, shrugging, which is his preferred coping method (and which he did about two dozen times in 45 minutes). 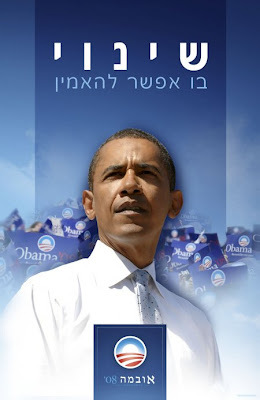 Democrats complain that he has gone even further with his ramped-up attacks on Mr. Obama. “The fact that the spokesperson for Hamas would say they would welcome the election of Senator Obama really does raise the question, Why?” Mr. Lieberman said recently on CNN. A few days later on Fox News he called Mr. Obama “naïve” in his views on Iran. In his office on Wednesday, Mr. Lieberman spoke of what he called Mr. Obama’s “remarkable change of position” on a variety of issues. He added that he was having a blast with Mr. McCain on the campaign trail, accompanying him on a trip to Colombia and Mexico this month. He has been a regular on Mr. McCain’s Three Amigos circuit, which includes Senator Lindsey Graham, Republican of South Carolina. All of which has angered his Democratic friends, or former friends. “I think there’s a difference in the way Joe has been treated now by people in his caucus compared to the beginning of last year,” Ms. Collins said. 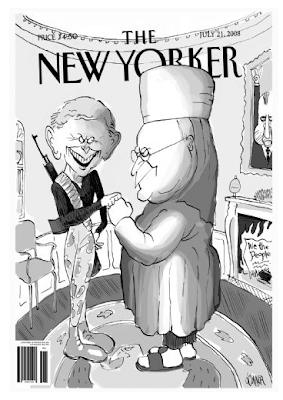 That was when Mr. Lieberman returned to the Senate after losing the Connecticut Democratic primary, running as an “independent Democrat” and prevailing in the general election. Mr. Lieberman continued to vote with his party most of the time, while the Democrats, clinging to a 51-to-49 majority, smiled tightly and tried to hold on to their flight-risk colleague. It has been tough, though. Mr. Lieberman has declared himself “liberated” from the shackles of party affiliation and seemed to delight in bucking Democrats on foreign policy matters. “There were times in my career where I really wanted to be supported, dare I say liked, by everyone,” Mr. Lieberman said in the interview. Mr. Lieberman said he had felt no ill will from Senate Democrats, though queries about him tend to elicit squirms. While entering the Tuesday lunch, many senators waved off questions about their prodigal colleague (one smirking), and several offered disparaging comments off the record. The Senate being a gentleman’s club, senators who did speak on the record about Mr. Lieberman tended to tread lightly. “There are those of us who are friendly with him and those of us who are not,” said Patrick J. Leahy, Democrat of Vermont, who did not place himself in either camp. Other prominent Democrats suspect that Mr. Lieberman is acting, in part, out of spite against a party whose voters have rejected him. “My own sense is that he was just bitterly disappointed by doing so poorly in 2004,” said Representative Barney Frank, Democrat of Massachusetts, referring to Mr. Lieberman’s early flameout as a presidential candidate. 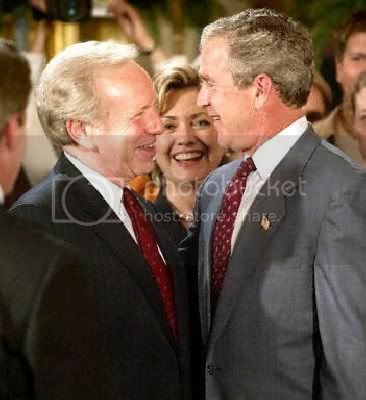 In his office, Mr. Lieberman had practiced answers and nondenial denials for the litany of questions he has received: whether he would be Mr. McCain’s running mate (“I’m not really interested, and I don’t expect to be asked”), whether he would take a cabinet post in a McCain administration (he is interested only in representing Connecticut in the Senate) and whether he is concerned that he is getting some of his lowest poll numbers in his home state in years (no). He would not, in other words, give a speech in the recent tradition of Zell Miller, the former Democratic senator from Georgia who endorsed President Bush in 2004 and derided John Kerry, the Democratic nominee, in a scathing keynote address at the Republican convention. What is clear is that Mr. Lieberman will not be attending the Democratic convention for the first time since he started going in 1976, the year Jimmy Carter was nominated in New York. He went that year as a delegate for Representative Morris K. Udall of Arizona, one of Mr. McCain’s political heroes. It was a lonely foray, he said, but he enjoyed it. He almost sounded wistful for a different time and a different party. There are Islamic Shariah Compliant Investments. Are there any Jewish Halakhah Compliant Investments? Watch out - Goldman Sachs and AIG are not Shariah compliant. Shariah compliant investment vehicles take socially responsible investing (SRI) to a new level, proving that conscious investing does not necessarily depress returns. Hedge funds can turn to specialty shops that specialize in weeding out investments that violate Islamic Law. Non-accredited investors (investors with less than $1 million to invest) can also gain admission by following Shariah indexes or mutual funds. Shariah Capital, one of the world's best Islamic financial institutions according to Global Finance Magazine, is one resource hedge fund managers turn to when developing strategies to meet the Shariah compliance needs of their clients. Islamic law scholars and attorneys work with clients to find suitable investments and devise products that attempt to mirror strategies involving short selling and the use of leverage. Standard & Poor's (S&P) has compiled more than 20 Shariah indexes focusing on specific countries, such as Japan or emerging markets and broad categories like global infrastructure and global property. Individual investors can begin by focusing on two broad Shariah-compliant equity indexes introduced by S&P earlier this year. The S&P CNX Nifty Shariah Index and the larger S&P CNX 500 Shariah Index are both in partnership with India's National Stock Exchange. Indian outsourcer Infosys (NASDAQ:INFY) is the most familiar stock among the top three holdings on each index. The other top holdings of each include, oil conglomerates, reliance industries and India's largest engineering company Larsen & Toubro (OTC:LTOUF). The Amana Trust Income Fund (AMANX) also helps investors take the guess work out of choosing Shariah compliant investments. The fund is almost completely void of financial service companies enabling it to outperform the Standard & Poor's 500 Index (S&P 500) by roughly 6% a year to date. The AMANX fund has a three and five year return of 11.72% and 15.78% respectively. The funds top three holdings, include United States Steel (NYSE:X), energy company FPL Group (NYSE:FPL) and natural gas company EnCana Corporation (NYSE:ECA). The Iman K Fund (IMANX) is a much smaller Shariah compliant fund with a similar focus. Socially responsible investing is growing in the U.S. Investors should know the rules other cultures incorporate into their socially conscious investment decisions. In addition to the social benefit derived from choosing investments based on Islamic laws the strategy has also proved to yield positive returns for its investors. Times: Samuel Israel III: Jewish or Christian?